Right from the very start of the competition, we knew that going for an attack on the House Robots would be a possibility. We weren’t going to throw away the competition for a chance, but they’re such big targets to pass on. Before filming even began, the new house robots were advertised as bigger, heavier and nigh-on unbeatable. We were, basically, taunted — so we decided to take on the challenge. We had a bit of luck in flipping Dead Metal & Matilda. In our first fight with Storm 2, in the league stages, we had lost drive in one wheel, so the robot was driving around in a big circle most of the time. It just happened to be that Dead Metal was at the end of that circle. Bad planning on his behalf! We always knew we had the power to flip a house robot – Apollo's flipper has the ability of flipping a minimum of a tonne – but House Robots like Dead Metal are very wide, so we knew it wouldn't be easy to flip him over. Matilda decided she would rescue Dead Metal, giving us the chance to get her while she was busy. We missed the first flip, but in doing so managed to damage Matilda’s backside — and before she could turn around and slap us for it, or hit us with her disk, we had the chance to flip her. Flipping Shunt again was more of the house robot being in the wrong place at the wrong time. Apollo was working perfectly in the heat final with Storm 2 (the rematch from earlier where we lost drive in one wheel, a problem that appeared a few times in earlier fights) and Shunt was playing too close to comfort, so he had to go too! What is the weight difference between Apollo and and the House Robots? The lightest of the house robots (Shunt) weighs around 230KG, compared to our 107KG. Matilda & Dead Metal both weigh around 350KG each. What type of gas powers Apollo's flipper? The flipper is powered by CO₂ gas. This is stored inside a standard size fire extinguisher, and carry 2kg of liquid CO₂ gas. Does it take more gas more to flip a House Robot? It doesn't use any more gas to flip a house robot, but it does run the risk of damaging the robot. The flipper arm was only designed to flip 110kg, and we did run the risk of damaging the flipper arm. How many times can Apollow flip before it runs out of gas? Apollo usual has around 10 to 15 full power flips, and then they will gradually get less powerful. However the studio and arena for the filming was very cold, this means the gas moves a lot slower around the system. Meaning the flipper runs with less power. 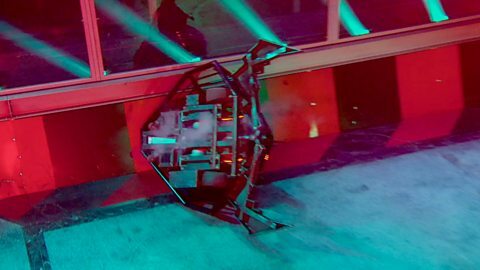 So this series of Robot Wars doesn't show the full potential of Apollo’s flipper. If we were to run in a warmer environment the flipper power would improve almost double. 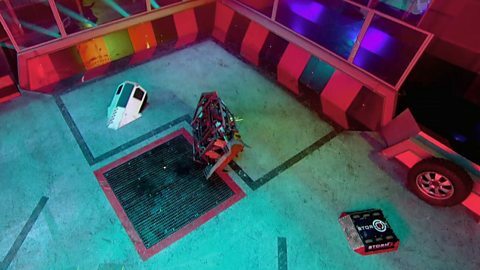 Do you think other teams could flip a house robot? Robots such as TR2 and Eruption could possibly flip a house robot. But both have less power and smaller flippers. When flipping a robot such as dead metal, you need the highest possible flipped to be able to turn over such a wide robot. Is the Sir Killalot is flippable? Kilalot is very much flippable, weighing under a tone so we know we have the power to be able to turn him over. He's just a very big robot, and has a very low centre of gravity so it would be a challenge. Sadly we never had the chance to have a go at Sir Kilalot... but he should watch out for next year! Apollo was designed on a mixture of robots, from within the team, and other competitors. Yes Apollo is another wedge robot with a flipper, but it’s and effective way to build a robot, and with many nasty spinner robots in the competition we had to have a robot with many angled sides to deflect attacks. 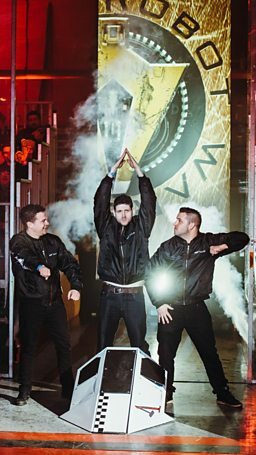 In the past the team have built a few other robots that have been very successful on the live circuit. We know people may get bored with a classic wedge robot with a flipper. But its a proven and effective shape. Being a wedge allows you to get under other robots and thats very important when you have a flipper. The multiple angles on Apollo mean any head on attacks from disks and other weapons are deflected away. The front of Apollo is almost twice and thick as the rest of the robot. Meaning any fight with a spinner, our method of attach is to drive straight into them and keep hitting them too. I have been building robots for 15 years. In all shapes and weight classes. I started building robots as a young teenager. Initially starting with small 'ant weight' robots. These little robots pack a punch and weigh only 150g! During my time with these I won the UK, European and world championships. I then went onto build 12KG feather weight robots. I was one of the first to build within this weight class. And as young teenagers myself and Dave Moulds (driver of Carbide) used to be two of the only feather weight robots fighting. So team Apollo and Team Carbide had an experience of fighting each other around 15 years ago. I then progressed with my brother into the world of heavy weight robots. He has since moved onto bigger and better things! And since the show finished I have worked on the live events of ‘Robots Live’ hosting and presenting the shows. Marc and Ben were both massive fans of the show and joined the team in late 2015. The former holiday camp bluecoats demonstrate the power of their 'launcher' robot, Apollo. Read more about the former members of the famous Pontins ‘Bluecoats'.